TWP 101 Cedartone Natural is by far the most popular of the 100 color choices accounting for 60-70% of the sales. The 101 is a traditional Cedar color. It highlights the natural grain of your wood with Caramel/Golden tones. TWP 102 Redwood is a popular choice for customers who are looking to add a rich red color. We call this color a “straight” red as it does not contain any other highlights. TWP 103 Dark Oak is a beautiful Dark Brown that will really enhance your wood. This color is popular for customers who are looking to get away from the traditional golden/cedar colors. TWP 115 Honeytone is the lightest and most natural looking color. This is a “golden” color that will highlight the natural grain of your wood similar to a clean “wet” look. TWP 116 Rustic is a red color. This color has become more popular than the 102 Redwood as it is a Reddish/Brown color similar to maroon. TWP 120 Pecan is the newest color in the 100 series line and was introduced as an alternative to the 101 Cedartone. This color is what we call a slightly brown/cedar color. Basically a little bit of brown was added to the 101 Cedartone to “tone down” the traditional orange cedar color. TWP 105 is a popular gray color that is a traditional gray. This color is heavier in solids than other TWP color choices. We consider this to be closer to a semi-solid. Is the gal size “cedar tone natural,” the same as “cedar tone” w/o word “natural” in five gal can? Cedartone and Cedartone Natural is the same thing in the 100 Series. Which do you use for cumaru? Many use the Rustic color. I just bought two gallons of Rustic and it says Rustic Oak. So these two cans must be old. Could you post a picture of the can and there also should be a small sticker with the date on it. 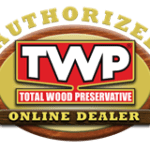 Is TWP rustic and TWP rustic oak the same color? Yes. The “oak” was dropped from the name years ago but just an FYI, the “oak” was used in the 1500 Series version, 1516 Rustic. I have a newly built pressure treated pine deck and two wall panels of the same material…which stain would best match my twenty year old cedar fence? 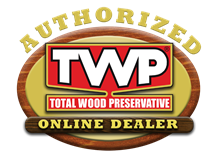 Once you weather the new wood and prep, try the TWP in any color you like. Does anyone have pictures of the pecan color on there deck? Can you mix the 2 grays with each other or any other colors? Yes, you can intermix the TWP colors as long as they are from the same series. Is the color 105 Prairie Gray considered a solid color or semi-transparent? It is closer to a semi-solid. I was thinking about using the TWP 103 Dark Oak stain on some oak I will be refinishing to use for a pickup truck bed. The bed will be covered when not in use, but i was wondering if it (the stain) is compatible with marine varnish or do you have a better product for maximum protection? The TWP cannot be top coated with a marine varnish. TWP 100 Series is a penetrating stain that will work for the bed but will not leave a shine. Hello, I am interested in TWP for our new deck (it was installed summer of 2017 and has weathered for 12 months). It’s a large deck, very large, with wrap around front porch. First, I was thinking of purchasing a paint sprayer to apply the stain – will a sprayer work with TWP? Second, we have an old farmhouse, white with black shutters, so I was wanting solid color stain – white on the railings and gray on the deck boards. Does TWP come in a solid white, solid gray? or at least a semi-solid white and semi solid gray? Yes the TWP can be sprayed but you will need to back brush to ensure an even application. TWP does not come any solid colors or white. 1. Yes, you can mix colors of the same series. 2. One coat is good for vertical areas. Not sure to use 100 or 1500 ?? I re-stained cedar deck last year with cedartone. Want to do a maintenance coat this spring without stripping. Thinking about using honeytone so existing finish won’t be so dark (vis a vis cedartone maintenance coat). Do you think that will work or should I just stick with cedartone for light maintenance coat? Want to try and achieve similar color from last year’s re-stain. Thank you! Stick with the cedartone. Make sure to prep first. Use the Gemini Restore Kit while pressure washing. You will need to remove the old stain first. How to remove depends on the type and the brand of stain that it is. if you post a picture that will help. Either series will work. You will need to wait the 4+ months for the new wood to season. Yes but only 1 coat. Does the cape cod gray look like natural weathered wood on cedar? Similar but not exactly like that. I have a question – we are restaining my deck that is about 4 or 5 years old. I tested the dark oak – because I don’t care for the red or golden tones – the dark oak is too dark. I have looked at sample of pecan and I’m afraid it is too light. Would you recommend or is it possible to mix the dark oak and pecan to get a medium color? Yes, you can mix stain colors together to achieve a color you like. I’m in Minnesota, and had our deck resurfaced last spring with green treated lumber. We let it weather over the summer and winter, and now are ready to stain it (after a thorough pressure washing). Which stain would you recommend to bring out the natural grain? Thanks! Prep with our Gemini Restore Kit. Stain with TWP 100 Series. I’m in Virginia. I want to use TWP 100 on my new deck this year, and want to recoat a year afterward. What happens if the VOC regs change next year and don’t allow the 100 in my state? What stain would i then order in order to do a simple recoat after brightening? The VOC will not change anytome soon. If it did, just use the TWP 1500 Series. Sorry but TWP does not come in a solid stain. How soon after the first application can a second coat be applied. Painter put a good first coat but appears to have been a thin coat. If i want to come back on the top, upper deck with a second coat in a month is that ok? As do i need to use the two part prep prior to second coat? Best to wait about 6-12 months, lightly wash, and apply a light coat. Does this product work on bamboo…..it not being wood but believe it or not it’s grass. I have 600sq mtrs and have had great difficulty in finding a winner. Even linseed oil is a no no. Thanks for help from experienced bamboo fencing lovers. Sorry, but it does not work for Bamboo. Please advise Which 100 stain is more medium brown? I don’t want red or yellowish stain. Thank you! TWP does not have a medium brown. Dark Oak is a darker brown. Pecan is a cedar brown. The grays are closer to a semi-solid but are not prone to peeling. I am applying 115 honeytone wet-on-wet to my deck. The deck is 35 years old pressure-treated), but it was covered with solid stain all those years and I had it all sanded down to bare and power washed. How long before I need to re-stain? If keeping the same color, what prep would be required? Also, is it OK to stain when hot and humid? Redo every 2-3 years. Prep with the Gemini Restore Kit. Do not apply when over 85 degrees. What happens if it is over 85 degrees? I used dark oak today on my deck out of a five gallon barrel. I stirred before I started applying but not again after that. When I started applying it was much more transparent then what I have in the last gallon. The deck has a bit of a reddish tone where the last gallon is a rich chocolate brown. Any thoughts? Most likely it was not mixed fully at start and it settled during the application. The pigment can settle to the bottom and a drill mixer is suggested to mix the pigment into the stain evenly. Can I mix in a gallon of a darker TWP 100 series color to the pail of 102 “redwood” to reduce its redness? If so, which color would you recommend? Yes you can. Try Dark Oak 103. I recently used 102 redwood color on a con hrt rdwd deck and the colors redder than i like. when i recoat in 9-12 months can i use a lighter color, like cedartone. thanks c.r. 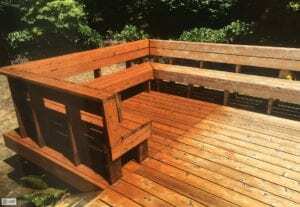 To go lighter, you will need to remove the Redwood by using the Restore A Deck Stripper/Brightener Kit. We applied twp 116Rustic two years ago to our cedarwood deck. The verticle surfaces have retained the color but the horizontal surfaces are fading and need redone. We are wanting a more brown tone…thinking of applying 120Pecan. Will the 120Pecan tone down the existing 116Rustic after we have cleaned the wood? Do we need to apply deck stripper and brightner or can we just clean and brighten? No it will not. Best to strip and brighten for the prep. Can I mix clear and dark oak to lighten the color of the dark oak a bit without creating any issues for myself? Yes, you can mix the TWP colors of the same series. How do I go aboutgetting (3) 1/4 pt.samples? Is cedartone 101 the same as Cedartone natural 101? I bought 3 gallons of TWP 101. Should I mix all together for even color on my deck? Or will that not be an issue? Cumaru deck: We are building a Cumaru deck and would like to apply TWP 100. We are thinking a clear coat. Which colors in your chart MOST closely resemble the natural color of Cumaru? I’m thinking maybe the 102 or the 115. Lastly, will a pigmented stain provide better and longer protection than the clear? Thanks. WHICH color is the CLOSET match to CUMARU ? All the colors will enhance the grain of the wood. Not sure which way you want to enhance? More Yellow, Red, Brown, etc? Love the dark oak. Not sure i want it that dark however, but i DO NOT want red or gold in my stain. Alternative? Yesterday our deck was partially stained until i saw the color and nearly died. please help me. You can add the clear into the dark oak to lighten the color. I’ve stripped, cleaned, sanded, brightened, then applied ‘wet on wet’ TWP 101 Cedartone on a cedar deck. I’m unhappy with the color. Probably should have gone with Honeytone. It seems overpoweringly orange. Is this expected? That is the correct color for the Cedartone. It does tone down in color after full cure. I have really enjoyed reading the information you folks have on your site. It’s straightforward and informative, and I have bookmarked several pages. We’ll definitely be using your products when our deck has dried sufficiently for prep and protectant. I just had a brand new rear fence installed with all redwood materials. I am looking to get the fence stained but did not want to use the redwood color stain. I’ll be ordering the TWP 1500 series, and was looking at the rustic or pecan colors. Any suggestions on which one of these colors might look best on the redwood fence? I’m looking for a more brownish tint, and trying to stay away from the golden and orange colors. Thank you for your help. Try the Pecan or the Dark Oak for a brownish color. What is difference 1500 between clear and natural? To make dark oak lighter should I use natural or clear? I have 4 year old cedar decking that was previously stained with TWP dark oak. Have sanded the decking down using 100 grit and like the weathered look it left. Looking to use TWP again but don’t want an “orange” color. Is honeytone the right choice? Honeytone is a golden tint. We do have sanples on our site so you can test. Is there a clear instead of colors in the 100 series?? Can TWP 100 stains be custom-tinted to match a previous stain? No, it cannot be custom tinted. You would need to strip and brighten for the prep. This way the TWP is able to properly penetrate into the wood grain. I’m in mid Missouri and just completed a cedar tone, PT pine deck. how long should I wait until I coat it? Would 101 be alright? Do I need any prep before applying to the new deck after letting it weather awhile? The TWP 100 is the proper series. No issues as long as you prep correctly. Use the Gemini Restore Kit for the prepping. We would suggest the Pecan for this deck.